VATICAN CITY (CNS) — Catholics and Buddhists from five U.S. cities have issued a joint statement expressing their commitment to work together to help lift their communities out of poverty and remedy other social ills in their neighborhoods. This new, practical approach to interreligious dialogue marks a shift from the more traditional discussions aimed at mutual knowledge and understanding to a greater emphasis on planned collaboration for social projects. “I see it as a reflection of a maturing of the relationship, where the dialogue shifts from verbal understanding to cooperation in community service,” said Ronald Kobata of the Buddhist Church of San Francisco. Kobata was in Rome in late June for the first national meeting of U.S. Buddhist and Catholic leaders. The June 22-27 dialogue included 23 Buddhists and 23 Catholics, mostly clerics involved in interreligious dialogue or social action, from San Francisco, New York, Los Angeles, Chicago and Washington, D.C. The theme was “Suffering, Liberation and Fraternity.” The local archdioceses supported the dialogue. They met in Castel Gandolfo, just outside of Rome. The meeting was sponsored by the Pontifical Council for Interreligious Dialogue and the U.S. Conference of Catholic Bishops’ Secretariat for Ecumenical and Interreligious Affairs. The dialogue was held in Italy upon the invitation of the council, whose members thought the context would help to establish “a firm footing” for the dialogue, said Anthony Cirelli, associate director of the USCCB secretariat. But for Kobata, interreligious collaboration in the area of social justice is not new. He said his faith community has been involved already in “providing dinners at homeless shelters” in cooperation with the San Francisco Interfaith Council. “Both the Buddhist and the Catholic traditions place much emphasis on extending mercy and compassion to the other,” he said. Buddhists, for whom mercy is “a supreme priority,” said Cirelli, have taken note that mercy is being given priority by Pope Francis as well, namely in his preaching and teachings and in his proclamation of the upcoming Year of Mercy. “This naturally translates into a common thread for more intentional collaboration and engagement between Catholics and Buddhists,” he said. Pope Francis met with members of the U.S. Buddhist-Catholic dialogue at the Vatican June 24. Though the pope’s discourse was short, he took time to greet each participant and exchange a few words with them. Cirelli said participants felt encouraged by their meeting with the pope. 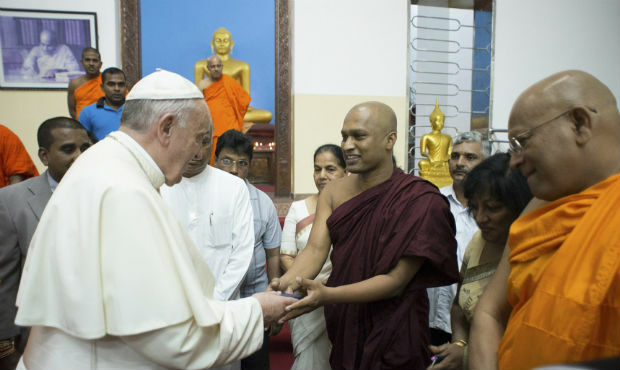 “I learned right away from the Buddhist leaders that the attention the Holy Father showed them by calling for this audience meant that he was serious about dialogue,” said Cirelli. Kobata confirmed the importance of the papal audience. “My impressions are that Pope Francis’ leadership, sincerity and dedication to promoting interfaith cooperation have inspired the participants in this dialogue to bring our communities together in cooperative efforts to promote peace, alleviate suffering, and live responsibly with our natural environment,” Kobata said. Cirelli said dialogue participants agreed on the importance of recognizing the “brokenness of human relationships” and of “intentional dialogue for bringing healing.” They also agreed that interreligious dialogue can be more effective when academic dialogue at a national level is complemented by grass-roots social action at the local level. Participants issued a joint statement at the meeting’s conclusion, identifying areas for collaboration and social action projects, such as climate change, youth outreach, prison ministry, restorative justice, affordable housing, and resources for migrants and the homeless.